Last year, the safari lodges inside Chitwan National Park were closed after the government decided that it went against conservation ethics for tourists to be staying in a protected area. The lodges inside the park attracted premium guests who paid more and the closure was a reminder of the old debate between ‘quality’ and ‘quantity’ tourism models. Bhutan imposed a high minimum charge for visitors and went for quality, while Nepal took a democratic approach and opened its doors to all. 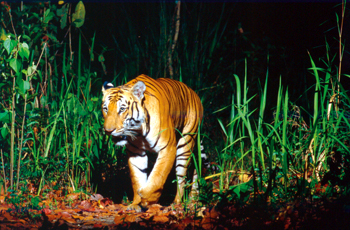 GLORY DAYS: The famous self-portrait of a tiger in Chitwan taken by a camera trap installed by Chuck McDougal. In the 1970s, Nepal was the flavour of the month. High profile international visitors, celebrity world travellers, mountaineers, and budget trekkers all flocked to Kathmandu Valley. The capital was an emerald Shangri La then, with little traffic, no pollution, warm welcoming people, and a lively culture. 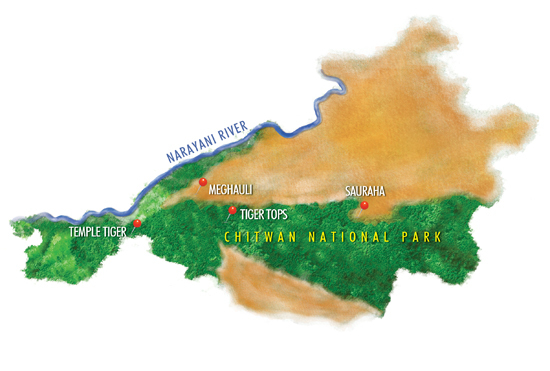 In Chitwan, Tiger Tops opened in 1965 and pre-dated the establishment of the national park in 1973. With its canopy rooms, jungle ambience, and conservation ethos, Tiger Tops set the standard and in its own right helped establish and market tourism to Nepal. But with the instability after 1990, tourism lost traction and the conflict halved arrivals. By the time the war ended in 2006, Nepal had lost its shine. 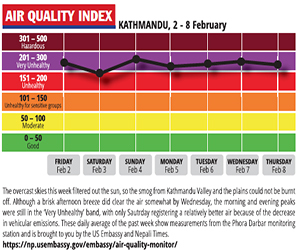 Kathmandu became a place to avoid, but a glut of airline seats caused by the Gulf migrant worker traffic led to a steady growth in tourist arrival numbers. Most of this was for the ‘back packer’ segment and the top end of the tourist market stagnated. If it hadn’t been for the increase in visitors from India, China, and Southeast Asia, tourist arrival figures would be dismal. Contributing to this erosion of ‘quality’ tourism has been the closing down of six lodges inside Chitwan National Park after their leases ran out last year. 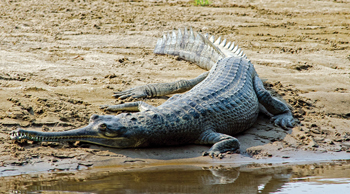 Chitwan is the largest and most easily accessible of the protected areas with the star attractions: the Bengal Tiger, the great one horned rhinoceros, and Gharial and Mugger crocodiles. 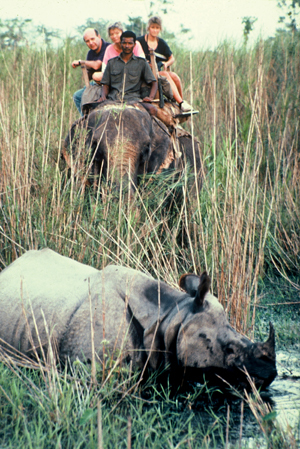 Tourists on elephant-back safari get up close with a grazing rhino in Chitwan in the 1980s. 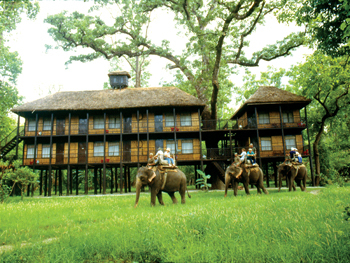 The Lodges were tucked away in the jungle, located to ensure the dispersal of impact of visitors, and well regulated by the government. Early morning elephant rides in the mist, jungle walks in the towering sal forests, jeep safaris, bird watching, float trips down the Rapti or Narayani offered special exposure of the highest quality before clients returned to the comforts of the lodges. Today, visitors are not dispersed, but concentrated in Sauraha from where government owned elephants are given priority access. Private jeep safaris are allowed for a fee. Wildlife exposure for visitors is limited and with Sauraha now overbuilt, new lodges are coming along right across the park boundary. For tourists willing to pay more, the safari experience in Chitwan is just not what it used to be. 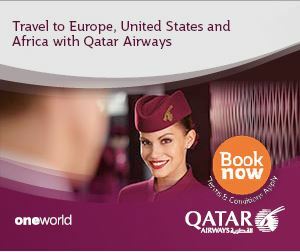 Higher paying clients now go to Bardiya, or even to parks in India and Africa. One of the advantages of having limited numbers of lodges inside the park was that it discouraged wildlife poaching and kept track of animal movements. It is still too early to tell, but in Sauraha the perception is that wildlife poaching has increased and one of the reasons could be the absent lodges. In Africa, poaching levels increased in national parks where lodges are kept outside. 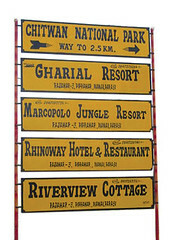 Tiger Tops in the 1970s, the Chitwan luxury safari lodge that put Nepal on the international quality tourism map. 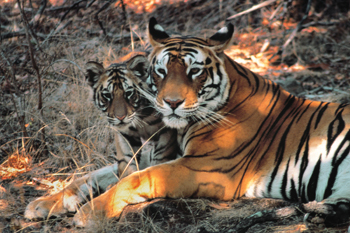 There are also financial implications, lodges were maintaining the roads and fire breaks, and patrolling the jungle. Now, without the hefty annual leasing fees the lodges were paying, the national park doesn’t have enough money for maintenance. Nepal needs to maximise its income from its tourism product. It can’t afford to lose the income and taxes from the lodges, the loss of 1,500 jobs, and another 1,000 or more daily wage staff. There was also the multiplier effect on provisions suppliers, transporters, and their families who have been adversely affected. There is a clear danger that with the closure of Chitwan lodges, there is an imbalance between quality and quantity tourism in Nepal. We have the ‘quantity’ side in the lodges in Sauraha, but the higher-paying quality tourists have stopped coming. We have the Himalaya, Mt Everest will always be there, Pokhara offers adventure tourism and fine hotels, the Great Himalayan Trail can revitalise trekking, and there is a vast potential for pilgrimage tourism to Lumbini, Muktinath, and Pashupati. 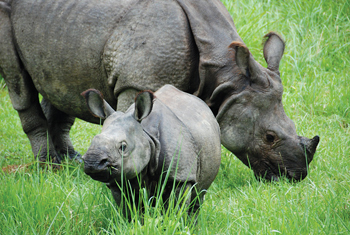 And with Chitwan, we have potentially the finest wildlife experience in the world. What more can a country ask or offer? Nepal must make sure to attract both ends of the market to maximise the potential of tourism to generate income and create jobs. We have the expertise, the products, and the service, but we must stop this downward drift towards ‘quantity’ tourism only. Chitwan can still help Nepal reverse this trend and ‘quality’ can be restored if the lodges in the park are given a new lease on life. Robin Marston travelled overland from the UK to Nepal 35 years ago this month and has stayed ever since. It is time Koirala the citizen and Koirala the president of the ruling party asked Koirala the prime minister to step down.